RAWALPINDI: Minister for Defence Khurram Dastgir called on Chief of Army Staff General Qamar Javed Bajwa at the General Headquarters (GHQ) of the Pakistan Army here on Tuesday. Matters relating to defence and security situation were discussed during the meeting, according to a statement issued by the Inter-Services Public Relations (ISPR). Prior to the meeting, the minister was briefed at the Military Operations Directorate on the country’s security situation. ADMIRAL ZAFAR CALLS ON GEN BAJWA, GEN ZUBAIR: Chief of Naval Staff Admiral Zafar Mahmood Abbasi also visited the General Headquarters and called on General Bajwa. The ISPR statement said that matters of professional interest were discussed during the meeting. The army chief congratulated Admiral Zafar on assuming the command of the Pakistan Navy. On arrival at the GHQ, the naval chief laid a wreath at the Yadgar-e-Shuhada and offered prayers for the martyrs. 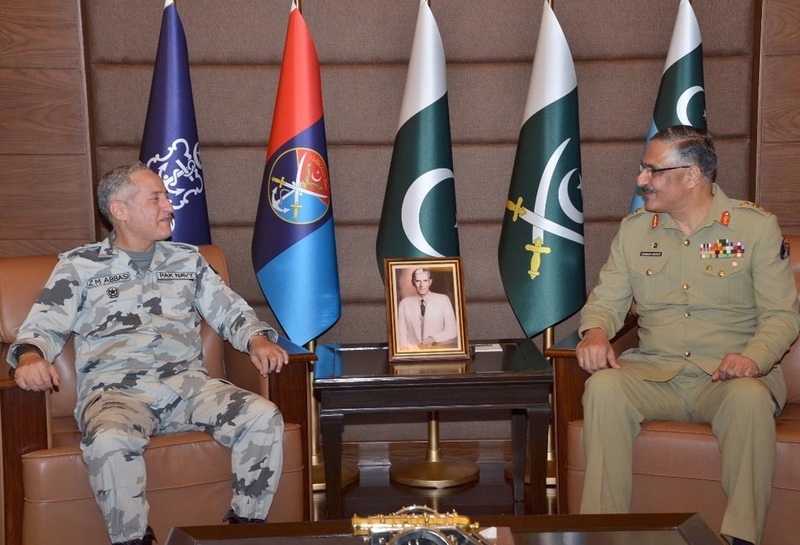 Admiral Zafar also called on Joint Chiefs of Staff Committee (JCSC) Chairman General Zubair Mahmood Hayat at the Joint Staff Headquarters. The JCSC chairman felicitated Admiral Zafar on assumption of command of the Pakistan Navy. General Zubair commended professionalism and commitment of the Pakistan Navy and lauded their performance in maritime security as well as the war against terrorism. There is much difference between the the Army and civilian Defence Ministers, more so with cheap and corrupt Prime Ministers.Look for instance on the previous Army Chief and the corrupt and self puffed up Prime Minister Nawaz Sharif. Gen Raeeil Sharif surpassed all previous Army Chiefs. Even look at all past Defence Ministers. They assume superior to the Defence Department that comes under civilian control. But we are lacking in a political working democracy with incompetent and mostly corrupt civilian authority. Look at at bizarre political parties and their cultist heads. Can Imran Kham who is mad to become Prime Minister fits with civilian authority over the Defence Authority. The culprit IK doled out 300 crores as a despot to Maulana Samiul Haq. He is a Taliban-loving person. What has Samiul Haq done with this booty? It is time to create a working political system in the country to keep a balance between the Army and civilian Authority. Democracy/Capitalism has failed Pakistan and it will continue to fail it, what do you expect from a system that espouses corruption and only looks after the wealthy and elite. In the Islamic system no one is above the law neither the Leader, Governor, Mayor. Politician or Army Chiefs, all are held accountable by the people as Islam encourages enjoining the good on the rulers, there are also other mechanisms such as the Court of Unjust Acts (highest court) or Majlis al-Ummah which even non-muslim partake in. The Muslims need to look to their own Aqeedah to solve problems!